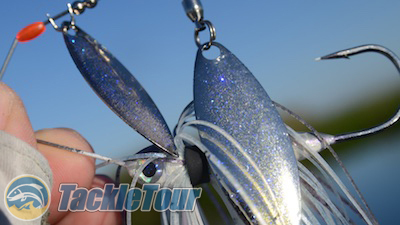 Introduction: Spinnerbaits were perhaps my first favorite bass fishing lure. Watching those old fishing shows with Bill Dance, Roland Martin, Orlando Wilson, Jimmy Houston and more, they seemed to always an inevitably throw a spinnerbait. So I'm always on the lookout for a spinnerbait that can catch my attention. The subject of today's review has a little different head design developed to make the bait look smaller than it actually is but still have plenty of weight behind it so you can make effective casts. 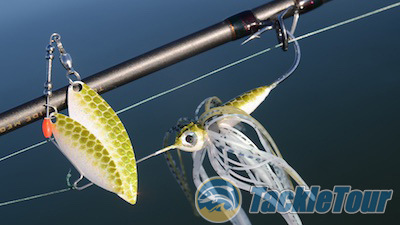 Here's our look at SpotSticker Bait company's S.O.B. Mini-Me Spinnerbait. Introducing the S.O.B. Mini-Me Spinnerbait by SpotSticker Baits. Quality/Construction: The MiniMe spinnerbait is weighted with lead and features a hand painted head in a variety of colors, a very full silicone skirt, and good quality hook, swivel and wire material. All the loops and closures in the baits we had were closed properly and the blades were aligned perfectly right over the head and hook. Performance: I fished this bait aboard a number of sticks two of my favorite of which were Megabass's F4.5-610ti Elseil Evoluzion C40 matched with a Megabass IS71 Hyper Lariat, and a Daiwa Steez STZ671MHFBA matched with a Daiwa SS SV baitcaster from Japan. Here you can see how the weight of the lure is stretched out towards the back of the bait keeping the head nice and compact for a smaller overall profile. Castability: The great thing about the Mini-Me spinnerbait is its head design. It features what we refer to as a compact head where the portion above the skirt is very small, but behind the spot where the skirt is tied onto the bait, extends the rest of the bait's weight mass like the body of a normal lure. A look at the quality hardware including Spro ball bearing swivels. 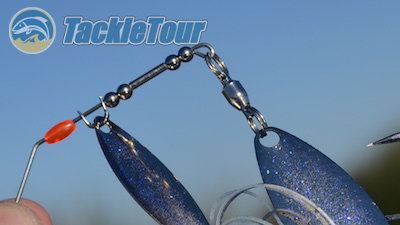 This allows you to present a smaller overall profile, but still have an actual full weighted bait to cast. As a result, the Mini-Me casts very well and certainly as well as any other spinnerbait I've thrown. All baits of this type flail a little in the air so none of them are perfect, but the Mini-Me has plenty of mass to get it flying to where you want it to land. 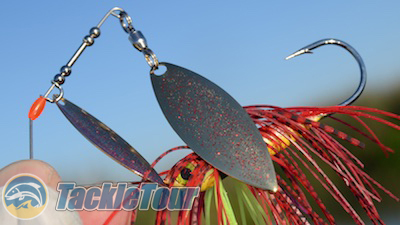 The blades are all custom colored to match the bait's color scheme. Slow Speed: The only blade configuration we tested was the double willow leaf design. Double willows are typically best fished with about a medium to fast cadence. The Mini-Me is no exception to this rule. Fished at a slow speed, the top blade will usually spin, but to get the inside blade moving, you really need to pick up a little speed in your retrieve. High Speed: Fast is one thing the double willow configuration can handle and handle it well. You can burn this bait back to the boat with no worries of it blowing out. Fished with your rod tip high, you can also make it wake just under the water. My favorite white and chartreuse. Action on Fall: Another thing double willows don't do that great is helicopter on the fall. Again the top blade will usually spin, but the bottom blade invariably gets stuck with not enough water flow around it to make it spin. This was also the case with the Mini-Me. Even the top blade spun intermittently.